Nice calm weather, but quite cold in the morning with + 3 degrees celcius. Weak shifting breeze, easterlies in the morning. Nets up 06-19, netmeter hours = 4100. After a slow start there was a steady trickle of birds through during the day, mostly European Robins and Chiffchaffs. In the end, a decent spring catch by Revtangen standards. Ringed: Collared Dove 1, European Robin 31, Song Thrush 1, Chiffchaff 7, Goldcrest 4, Linnet 1. Total = 45. Also 11 controls. 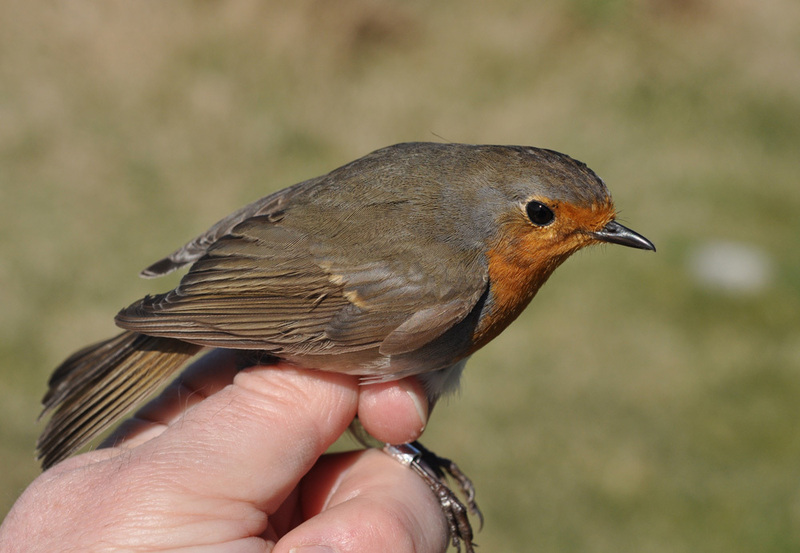 European Robins made up the bulk of todays catch. This one is a 2cy (around 2/3 of the greater coverts are juvenile feathers). Alf Tore Mjös. 1 visitor.